Make sure to choose a hike that’s appropriate for your kids’ age and skill level. Headwaters has more than 8 miles of trails to choose from that range from an easy stroll to a miles-long trek. 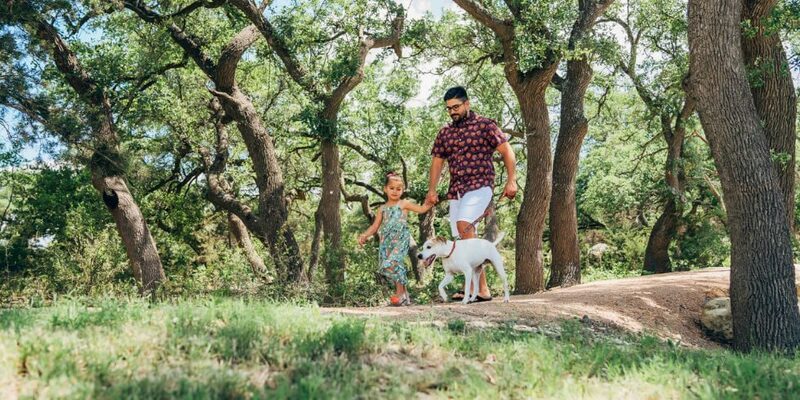 And, once your little ones have gotten in some practice, you can start exploring the Little Barton Creek greenbelt, which you can access directly from Headwaters. Kids love feeling like they’re in charge and giving them special responsibilities can help make them feel more involved. Let them carry a small backpack with their own snacks and water, or let them lead the family along the trail. These small things can go a long way in getting them excited for next time. Bring some fuel for the journey! The day before your hike, set up a build-your-own trail mix bar with pretzels, nuts and dried fruit, and let the kids create their own snack. Then you’ll all have something delicious to snack on during breaks. Little things like binoculars, a bug net or magnifying glass can turn a normal family hike into a road full of discoveries! You could even plan something bigger like a family scavenger hunt, geocaching or a game of plant bingo. Guides to native plants and birds are also a great way to get the kids engaged with their surroundings. Kids don’t have the endurance adults do, so they’re going to need to take frequent breaks to rest and rehydrate. Let the smallest traveler set the pace and use the opportunity to explore your surroundings. You never know what kind of interesting plant or cool critter you might have walked past otherwise! Headwaters’ amenities are designed to encourage residents to connect with the outdoors and explore. To learn more about the amenities and lifestyle at Headwaters, schedule a tour or join our Interest List.